The Department of Arabic is one of the oldest departments in the University dating back to 1922, the year of the inception of the University of Delhi. However, the department was not an independent till the late sixties when it got an independent entity. 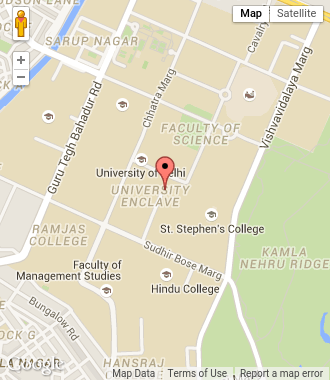 At first, the classes used to be held at St. Stephen College, a constituent college of the University of Delhi. To begin with, the renowned erudite personalities such as Shamsul Ulama Maulana Abdur Rahman and Maulana Saeed Ahmad Akberabadi rendered their services for the department. In the late fifties the department of Arabic with its sister departments­­­­- the Department of Persian and the Department of Urdu- was shifted to the well-known Arts Faculty Building. The Department of Arabic thus passed through three phases. At first it was working under the umbrella of Department of Arabic, Persian and Urdu. At the second stage the Department of Urdu became independent and the Department of Arabic and Persian remained combined. Afterwards the Department of Arabic got independent in the late sixties. A1 University Teaching Assistantships (UTA). A2 JRF through UGC/NET and CSIR/NET. A3 Fellowships of CSIR/ ICAR/ICSSR/ICMR/DBT/DST or from any other recognized government institution/organization. A7 Candidates with UGC (non-NET) fellowships Rs. 5000/- fellowship under the new scheme. Teachers of the University of Delhi and its affiliated colleges. Foreign students with their own fellowships. B.A. (Hons.) examination in Arabic of the University of Delhi or an examination recognized as equivalent thereto. B. A. (Programme) examination in Arabic of the University of Delhi or an Examination recognized as equivalent thereto with at least three papers in Arabic at B.A. level. Min. 40% marks in the aggregate or 40% marks in the aggregate with 45% in the subject. B.A. examination of the University of Delhi or an examination recognized as equivalent thereto and also Mauli Fazil Arabic of the University /Board recognized for this purpose. Min. 40% marks in the aggregate. Honours examination in Arabic language and have been awarded the Degree under clause 8 (d) of the Punjab University. Min. 50% marks in honours examination and B.A. Degree. M.A. /M.com/M. Sc. Examination of the University of Delhi or an exam recognized as equivalent thereto. Min. 40% marks in aggregate in master’s Degree provided passing the Advanced Diploma examination in Arabic of the University of Delhi or an equivalent examination thereto. B.A. (Hons. )/ (Pass)/B.Com. (Hons. )/(Pass)/ B.Sc. (Hons.) /(Gen.)/ B.U.M.S. Unani Medicine (Fazil –tibb-wa Jarahat) of the University of Delhi or an examination recognized as equivalent thereto. Min. 40% marks in aggregate provided passing the Advanced Diploma in Arabic of the University of Delhi or an equivalent examination thereto. The students seeking admission under category 3,4,5 and 6 will be admitted after passing a written and oral test of B. A. (Programme) standard. Such students should get at least 40 % marks in the test. (ii) For purpose of admission to M.A. course the students of one year special Certificate course of University of Delhi in the subject concerned will be treated at the par with the candidates who have passed the honours Course under 10+2+3 scheme of education from the University of Delhi. Diploma in Modern Arabic, or B.A. in Arabic, or Bachelor Degree of any discipline with Arabic as one subject. (a) Certificate course in Modern Arabic of the University of Delhi or an examination recognized as equivalent thereto. (b) Senior School Certificate examination with Arabic as one of the subjects. (c) B. A. (Programme) or (Hons.) examination with Arabic as one of the subjects. (d) M.A. examination in Urdu/Persian with Arabic as one of the optional papers. First preference will be given to those passing their qualifying examination with first division and are under the age group of 30 years. Those students who have passed the Senior School Certificate examination of the Central Board of Secondary Education, New Delhi, or an examination recognized as equivalent thereto, and have working knowledge of Urdu or Persian are eligible for admission to the above Certificate Course. First preference will be given to those passing their qualifying examination with first division and are under the age group of 25 years.